OK, so this on-trend piece isn’t really that new, but in summer 2015, no wardrobe can get away without a really pretty, airy summer dress. Whether you’d like to make a flowing, hippy-style maxi dress or you’d prefer a classic wrap dress, the summer season wouldn’t be complete without a really pretty summer dress. 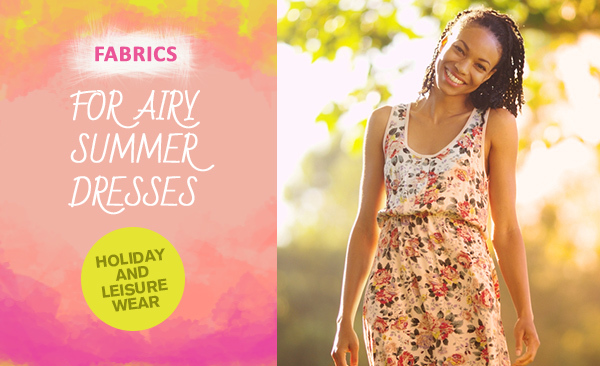 At myfabrics.co.uk, you’ll find a host of materials for summer dresses – from airy viscose and chiffon fabrics through to beginner-friendly cotton fabrics. Get inspired! This entry was posted in General and tagged Apparel Fabrics, summer dresses, summer fabrics by Christine. Bookmark the permalink.